The digital era has brought immeasurable growth to many industries and sectors today, and education is no exception. Digi Telecommunications Sdn Bhd (“Digi”) is taking a step to reduce inequalities through digital education empowerment by introducing Digi Academy (“DA”). This initiative is in line with its focused commitment towards UN Sustainable Development Goal #10. As part of the Digital Inclusion arm of Digi’s Yellow Heart initiative, DA is a platform to provide opportunities for future skills learning, including coding and programming to underprivileged secondary school students located in selected internet centres managed by Digi. “Digi Academy also supports our long term aspiration to transform all 132 Digi-managed internet centres to double up as a future skills education hub, beyond the other complimenting community services offered, and in keeping up with the changing times and relevance to the needs of the surrounding communities,” Philip added. DA’s pilot programme began in July and will run for the remaining months of the year. Classes are conducted either weekly or in accordance to a set schedule determined by the respective Internet Centre managers themselves. The modules used are designed by Digi in partnership with Arus Academy, a social enterprise that provides after-school classes where students learn how to actively solve problems by building and creating their own physical and digital solutions. To ensure the sustainability of the programme, Digi employed a train-the-trainer approach whereby the managers of those internet centres undergo workshops to familiarise themselves with the future skills modules. They are also exposed to the necessary skills to conduct their own classes, customising lesson plans and pedagogy skills that would enable them to even pursue an educator career should they decide to do so. Progress is monitored closely and assessed by the programme committee to ensure proper coordination and delivery modules. The modules in DA focuses on a mix of technical and non-technical skills. For this pioneering year, technical skills would cover everything a student needs to know to get them started on programming microcontrollers (Arduino). This would be complimented by other elective subjects that include understating Makerthon concepts, 3D printing and content creation (Design and Video fundamentals). Non-technical skills would cover topics ranging from design thinking, business modelling and pitching techniques. By focusing on these skills collectively, students have the much-needed advantage to deepen their understanding and enthusiasm into computational thinking and business-related topics. Towards the end of the programme in November, 20 top performing participants together with their managers from the Internet Centres will participate in a weeklong bootcamp. There, the they will form groups and undergo practically every aspect of project-making, from leading in ideas, conducting surveys, validating, data analysis to rapid prototyping their projects. These projects will then be showcased and presented to the project committee and partners. Experiential trips relating to maker activities are also being planned as part of the visit to provide meaningful insights and experience to the students and managers. The bootcamp will end with a certification ceremony to mark the closure of the first batch of DA this year. Digi Academy which is supported by the Malaysian Communications and Multimedia Commission (MCMC) is part of Digi Sustainability’s Yellow Heart efforts. Yellow Heart centres around keeping families and communities safe and connected through responsible digital usage and has two focus areas – Digital Inclusion and Digital Resilience. Digi believes connected societies are empowered societies and seeks to empower undeserved and underprivileged communities with digital solutions to connect them to what matters most. To learn more about Digi’s Yellow Heart initiatives, visit http://digi.my/yellowheart. Yellow Heart is Digi’s promise to help reduce inequalities, in support of United Nation’s Sustainable Development Goal #10. Digi has chosen to address this challenge as reducing inequalities has clear social and economic benefits towards a country’s long-term development. 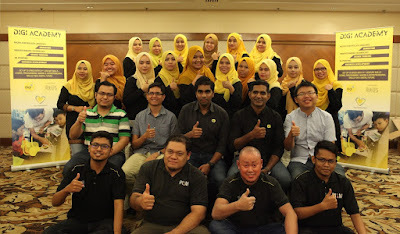 Yellow Heart works toward reducing the inequality gap through two focus areas - building digital resilience by ensuring Malaysians and their children are protected on the internet through responsible digital usage and enabling digital inclusion by empowering every Malaysians with access to the internet. For more information on Yellow Heart, please visit www.digi.my/yellowheart.